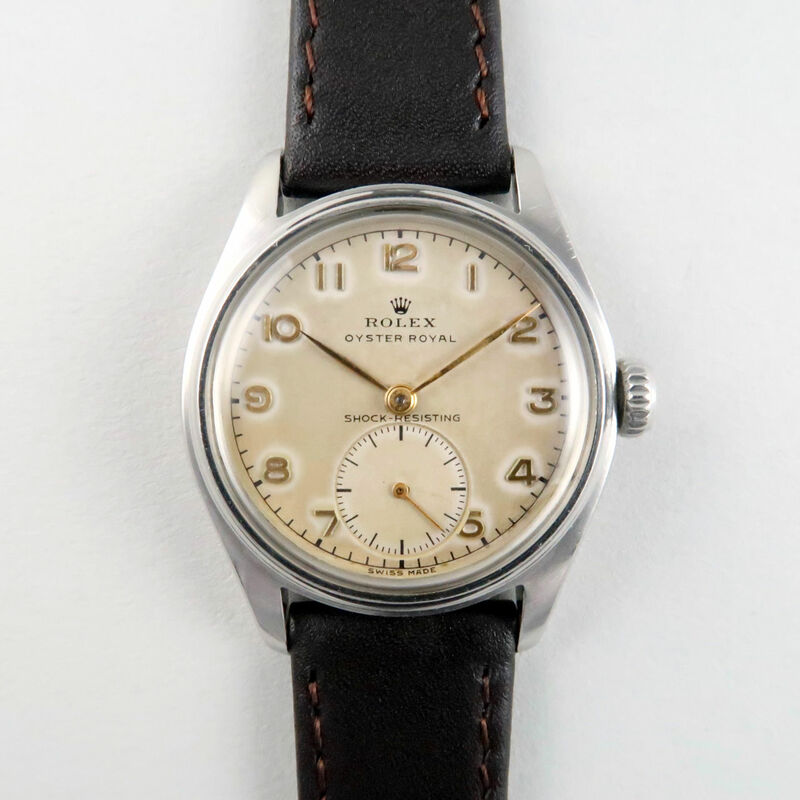 First up this week is a very handsome mid-century Rolex which has a wonderfully evenly patinated dial which blends particularly well with its gilded Arabic numerals. This model features a distinctive scooped bezel and is fitted with Rolex’s ‘Super Oyster’ crown. Introduced for a short period of time from c.1951-1953, the Super Oyster crown was developed as an alternative water-resistant crown to the traditional screw-down crown that Rolex had first launched in 1926. Super Oyster crowns were used for only a very short period of time in the early 1950s with production quickly reverting back to the screw-down Oyster in c.1953. Many of the Super Oyster crowns were replaced with screw-down crowns during later servicing and original examples are becoming increasingly scarce. The Super Oyster crown acts in the same way as a standard crown and can be wound in the resting position. 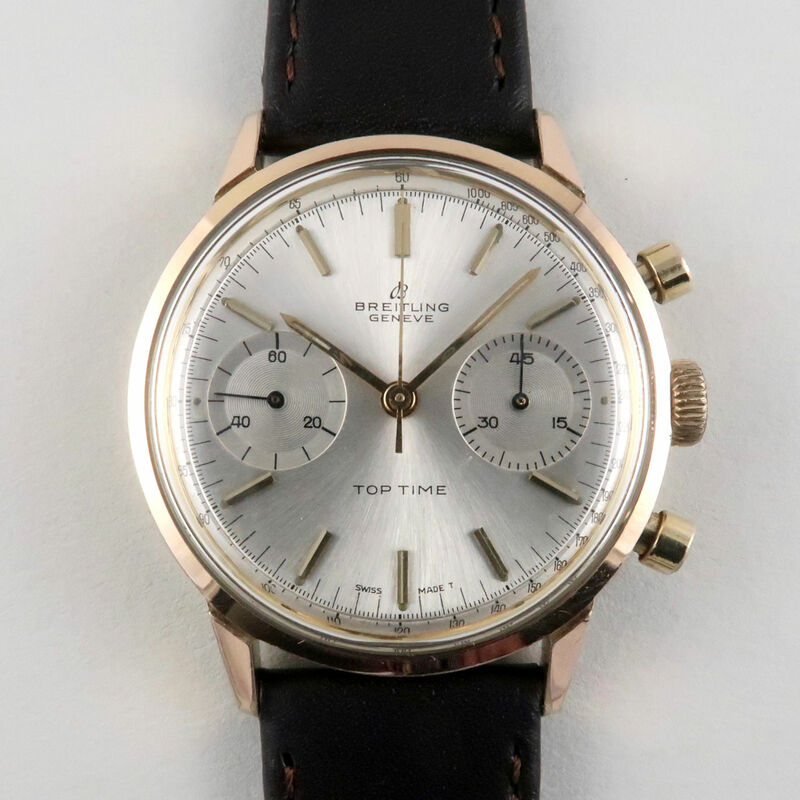 A classic chronograph model, the dial of this Top-Time is typical of the simplified, pared-down designs so favoured by watchmakers during the 1960s. The dial itself has a satin finish and there are two subsidiary dials which display constant seconds to the left whilst, to the right, a 45-minute counter registers minutes whilst the chronograph is running. The watch is powered by the Valjoux calibre 7730. This steel Zenith wristwatch utilises the watchmaker’s calibre 120 which has provision for hack feature – when the crown is pulled out to set the time, the seconds hand will stop allowing the watch to be easily synchronised to a time signal. 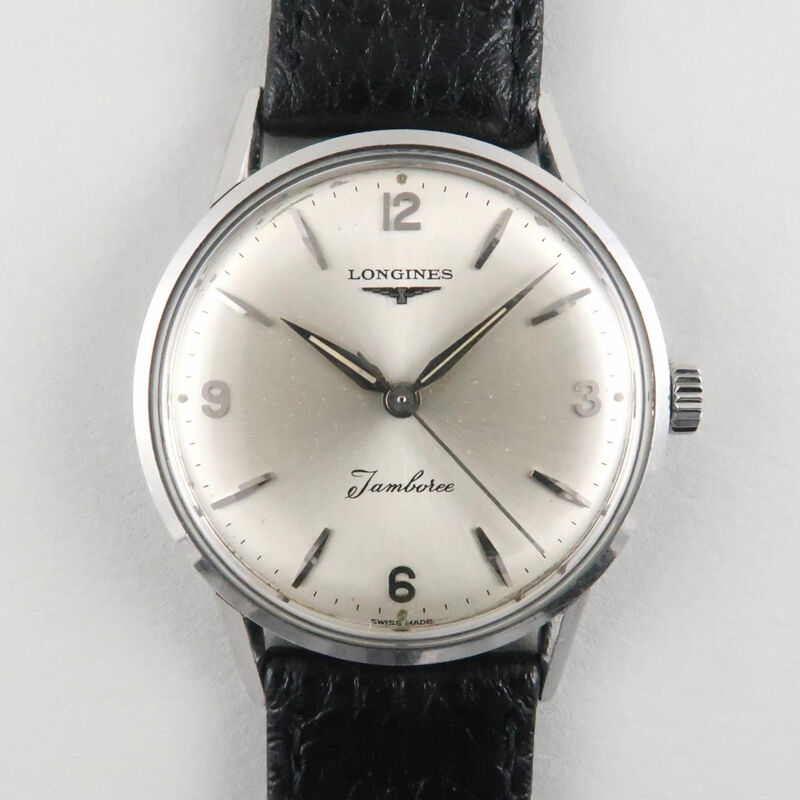 The silvered dial is fully set with raised Arabic numerals and there are classic ‘dauphine‘ hands. As detailed to the dial, this Zenith was originally retailed by W. R. Bullen, a jewellers established in 1887 and located in the city of Norwich. With a super stylish dial design comprising Arabic and lozenge-shaped indexes, this model also features its own unique Jamboree logo. Manually wound, the watch is powered by the calibre 280. 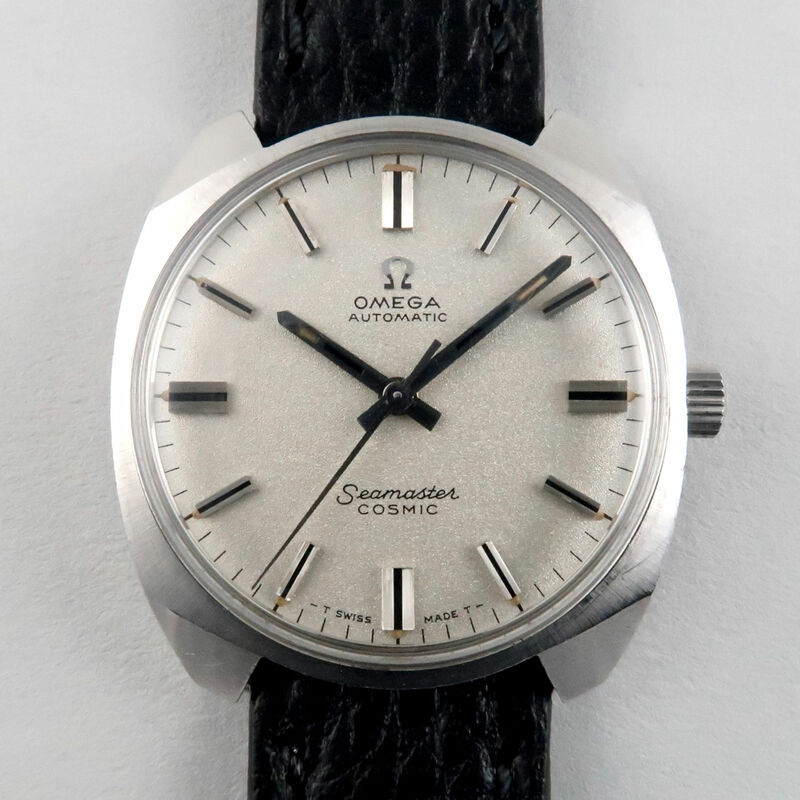 This Seamaster Cosmic is an unusual model that was first introduced by Omega in 1967. The present example has a handsomely stark, light grey dial with a stippled surface and applied indexes which have finely ribbed surfaces and are centrally set with black inserts. Cased in a single solid block of steel, the cushion shaped case has a satin finished bezel and faceted down-turned lugs. Formed in the early 20th century, the English firm of S. Smith & Sons initially retailed both Swiss and English watches and clocks. 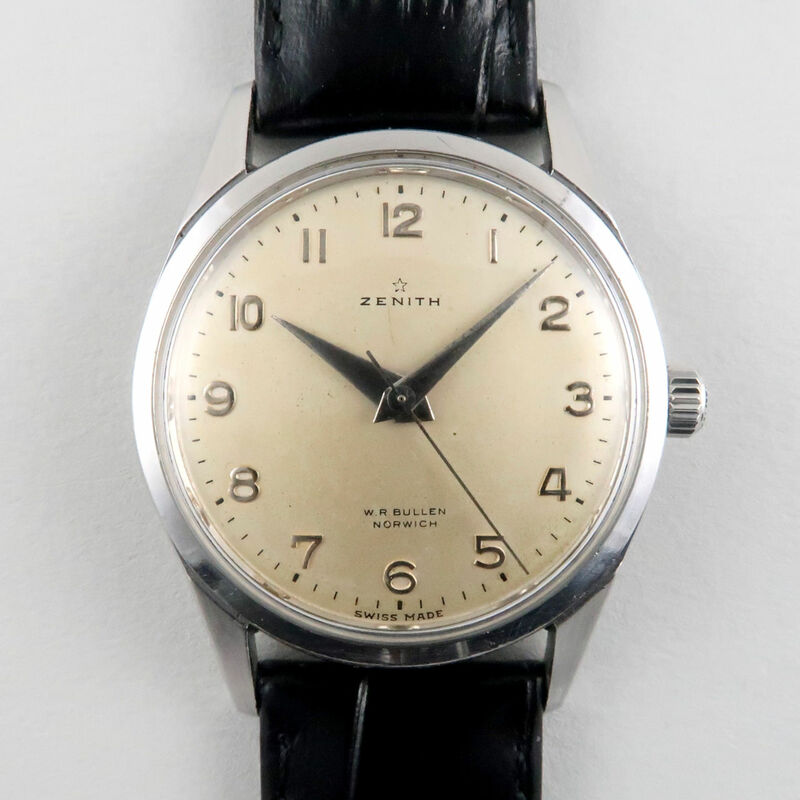 During the Second World War the company manufactured their own watches for the military but, from the mid 1940s, Smiths began to produce higher grade wristwatches which led to a transformation of their in-house production. 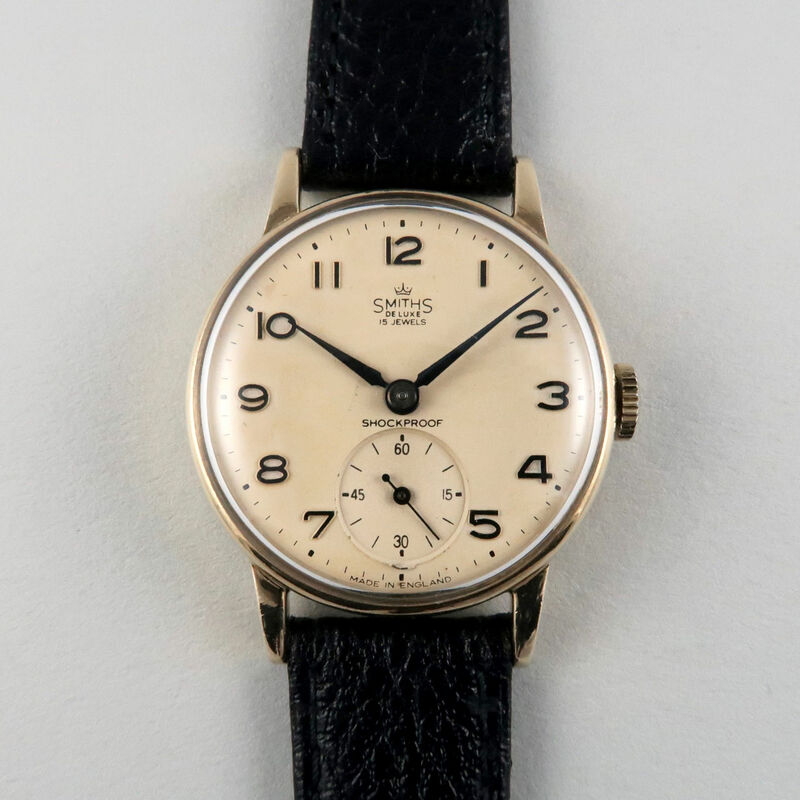 This 9ct gold, mid-sized wristwatch has a handsomely patinated dial and incorporates Smiths’ calibre 12.15 movement which was manufactured in Cheltenham. The latest additions to the ‘tools and storage’ section of the website include these tan leather versions of our pocket watch and wristwatch pouches as well as a new tan leather 5-pocket watch wrap. 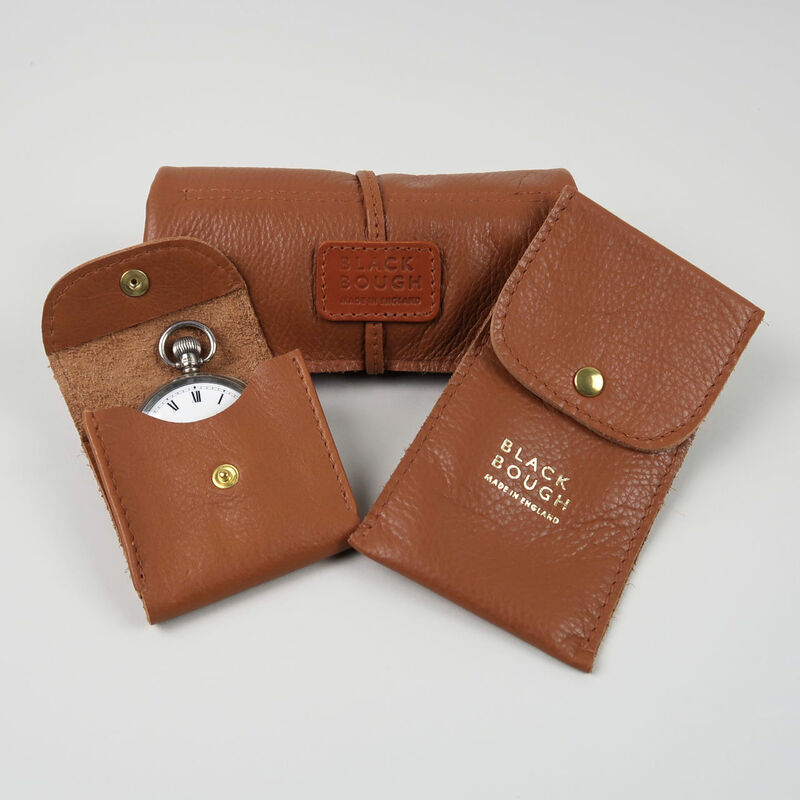 Made in England, these wraps and pouches are also available in black and dark brown leather options. You can subscribe to receive these updates automatically via email HERE or by selecting the ‘join our mailing list‘ tab at the bottom of any of our web pages.